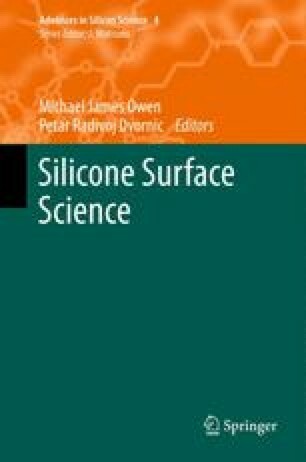 We provide an overview of fabricating functional surfaces by surface modification of parent silicone elastomer networks (SENs). Specifically, we demonstrate that polydimethylsiloxane and polyvinylmethylsiloxane represent convenient platforms for generating materials with tuned surface chemistry, topography, and mechanical characteristics. We discuss strategies that facilitate the manufacture of chemically-tailored flat supports as well as those that exhibit tailored topographical corrugations. We provide several examples of technological applications utilizing such structures. We also use SENs as supports enabling tailored assembly of molecules and macromolecules and outline techniques providing generation of substrates with position-dependent properties. We discuss new opportunities in using SENs as a platform for creating substrates that alter their properties swiftly in response to external stimuli. Finally, we offer a brief account of coating methodologies leading to the generation of bilayered sandwiched structures with tailorable chemistry and modulus. We acknowledge gratefully the financial support from the National Science Foundation and the Office of Naval Research. We are also grateful for the gift of PJ Fluid from the Dow Corning Corporation. Finally, we thank our many colleagues around the world for fruitful collaboration on various SEN-related projects over the past several years. Specifically, we thank William Wallace, Daniel Fischer (both NIST), L. Mahadevan (Harvard University), Evangelos Manias (Penn State University), Laura Clarke (NC State University), Manoj Chaudhury (Lehigh University), Dwight Schwark (Cryovac SealedAir), Jan Groenewold (University of Twente), Russell Gorga (NC State University), Simon Lappi (NC State University) and others.